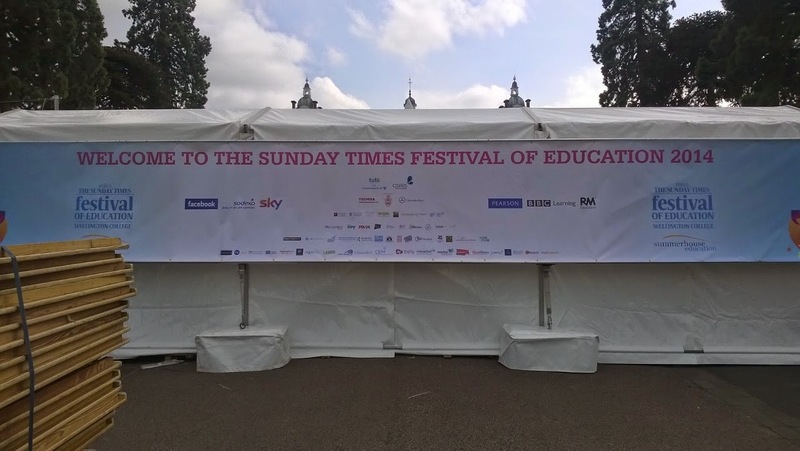 We have just got back from the Sunday Times Festival of Education - which was very different from any other show we have done. 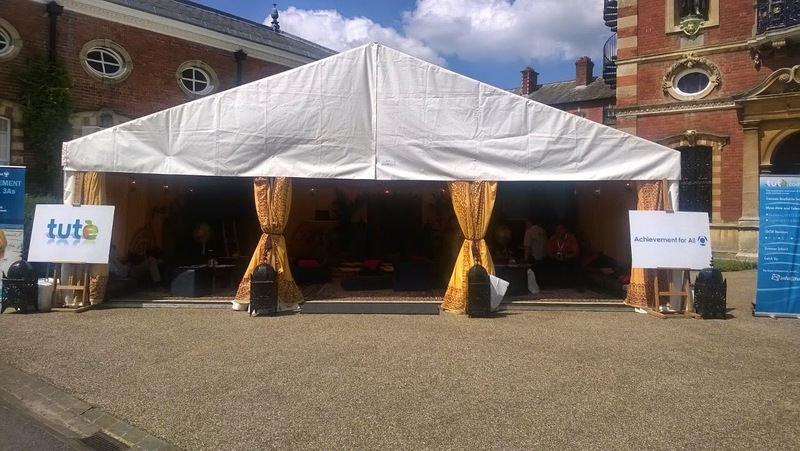 Firstly it was held at Wellington College - one of the best public schools in the world and secondly it was held outdoors. Luckily the weather was hot and sunny for the whole two days. We actually went down there on Thursday as it is a three and a half hour journey from Staffordshire. Darren drove and we packed his MassiveMobile with Jigsaw School Apps banners, leaflets, pens, biscuits and staff and set off for Royal Berkshire. 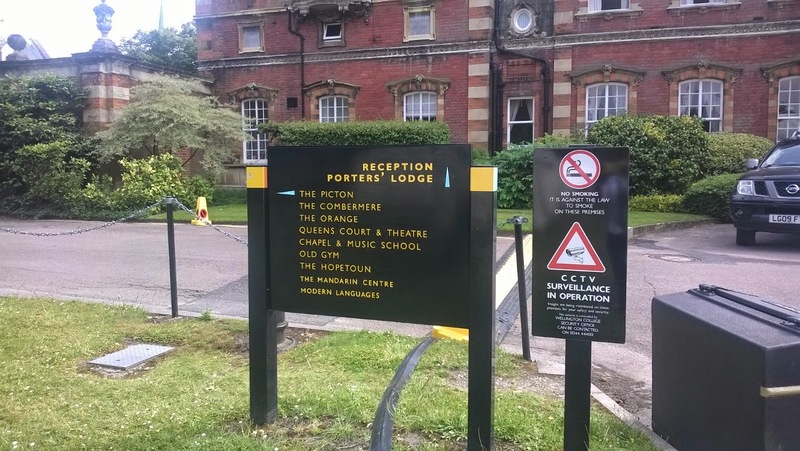 Our phone satnav capabilities got us to the school by 4pm and we gasped as we allowed through the security barrier and drove up the long tree-lined driveway and saw the main buildings. It is a beautiful place with huge grounds including a lake, cricket pavilion and ground and full-sized golf course. It was opened in 1859 by Queen Victoria and names after the Duke of Wellington. It has had many famous pupils - more recently Rory Bremner, James Hunt and Will Young! 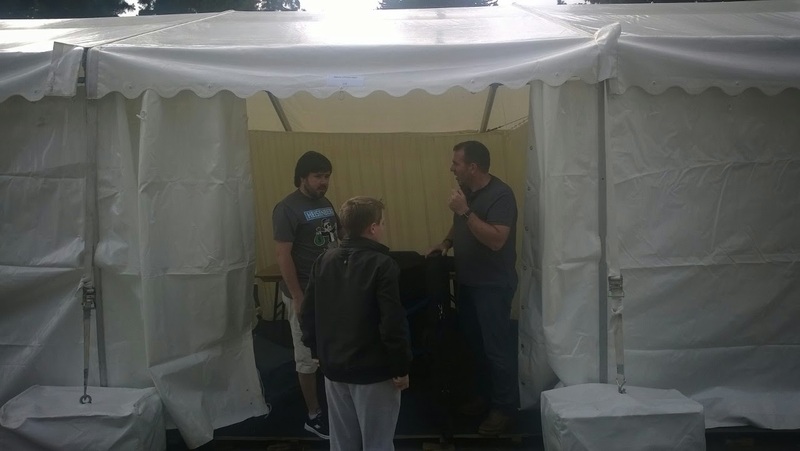 We saw lines of white marquees so heading that way we found the Festival office in a Portacabin. Darren handed over the paperwork and he got his official festival badge - although we did not get any for the rest of us! 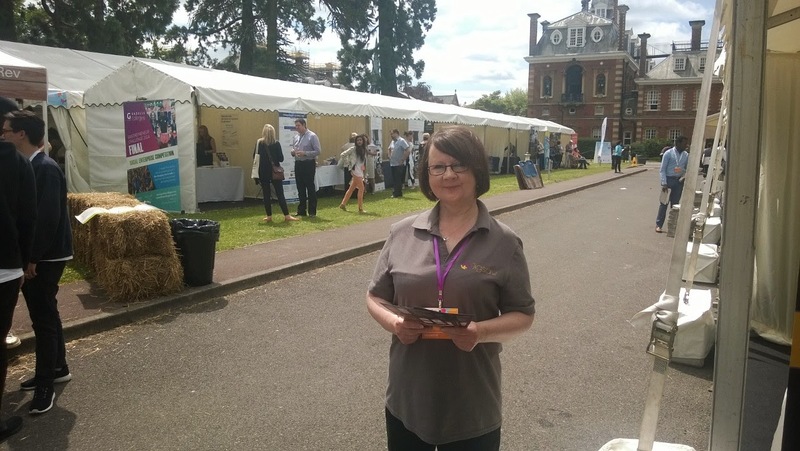 There seemed to be a little confusion - but eventually we were given handwritten ones and we could go and set up our Stand 114 in the marquee. We got everything set up pretty quickly then went off to Reading to find our hotel for the next couple of nights: The Best Western Moat House It was around 7 miles away. They are starting up the barbecues! The next morning we were up bright and early for a good breakfast before facing a long day! 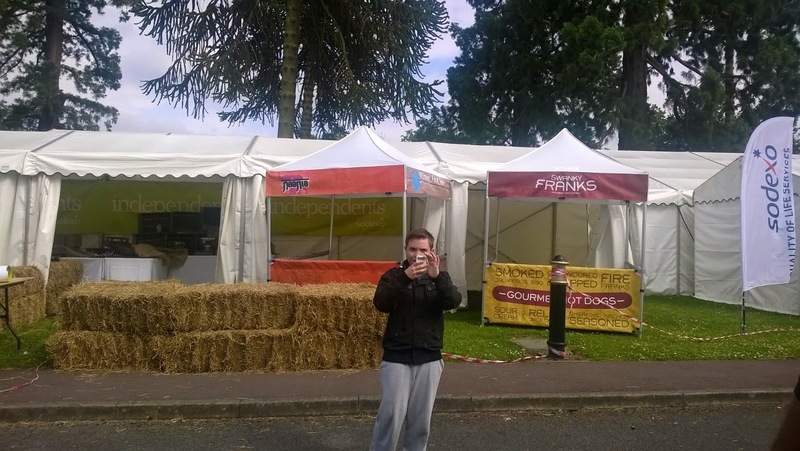 We were pretty happy to see that we were situated opposite the food tents with their barbecues and hot dog and kebab stands. Not only would we be within easy reach of food when we got peckish - but it would also be a very popular area with visitors too. The sun was beating down on us and it got hotter and hotter as we talked to people and handed out leaflets and gave demos. Gradually as the day wore on our stand went into shade and gave us a bit of relief. I was certainly glad that I had put Factor 50 sun cream on! We chatted to lots of lovely folk - some heads of schools, lots of teachers and even families and children. Also the students from Wellington itself were walking around and many were really interested in what we were doing. Some of the staff came to look too. It was very different as they had a lot of sessions going on with high profile speakers and guests. This meant that it was only the breaks in between when people were strolling around the exhibits. So we had quiet times - then sudden bursts of activity! There was me and Nathan and Darren and his son Josh - so we were able to take a few breaks ourselves to have a look around. D and J went to see Simon Singh doing a session about the mathematics of The Simpsons and N and I caught a bit of Michael Gove's session! Whatever you think of him and his policies - he was pretty brave to face a lot of teachers and answer their questions. 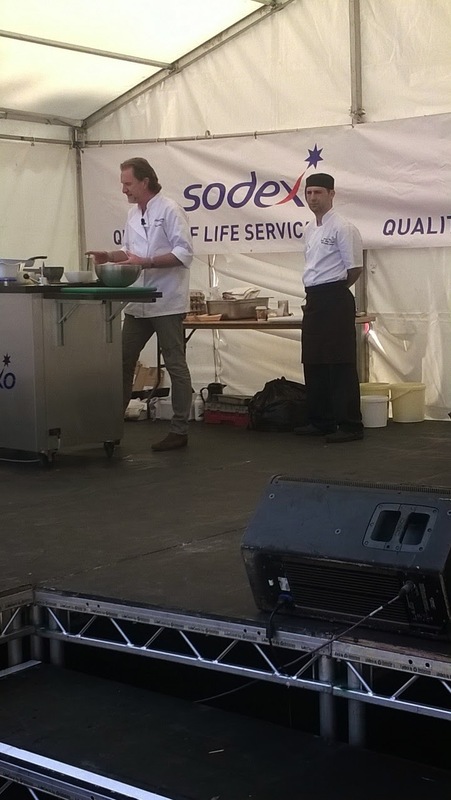 Paul Rankin cooking his burger. 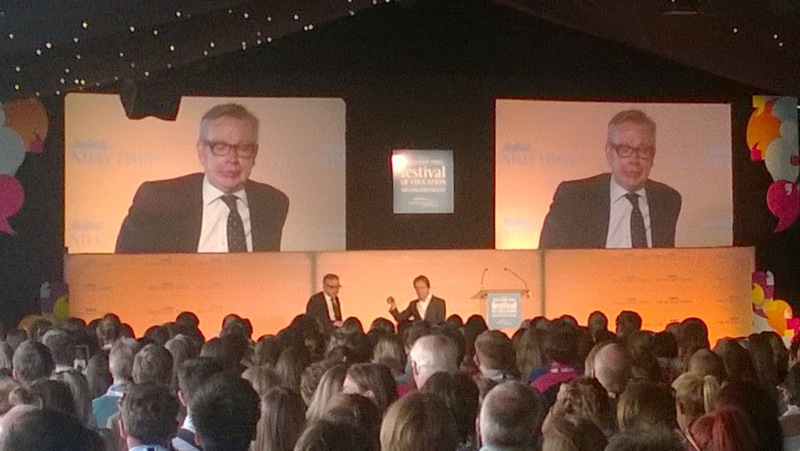 Mr Gove facing a grilling! It was lovely to walk around the college grounds while we had a break for lunch. We visited the students' V&A Café for delicious cakes and drinks and their Tuck Shop for chocolates and ice cream. I tried the chicken kebab in a flatbread from the stalls opposite on my first day and a barbecued salmon on chiabatta on the second. 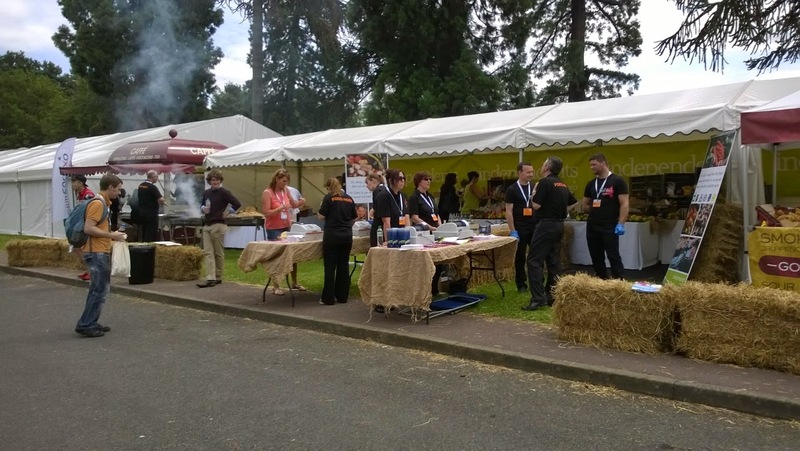 N actually had the Paul Rankin spicy burger the second day - and was offered loads of the pulled pork at the end of the second day when they had lots left. They were handing out free food that afternoon - I got a fresh fruit salad and carrot cake! After our first day we hung around the grounds as we'd been invited to a Networking Event involving Mexican buffet and live music. 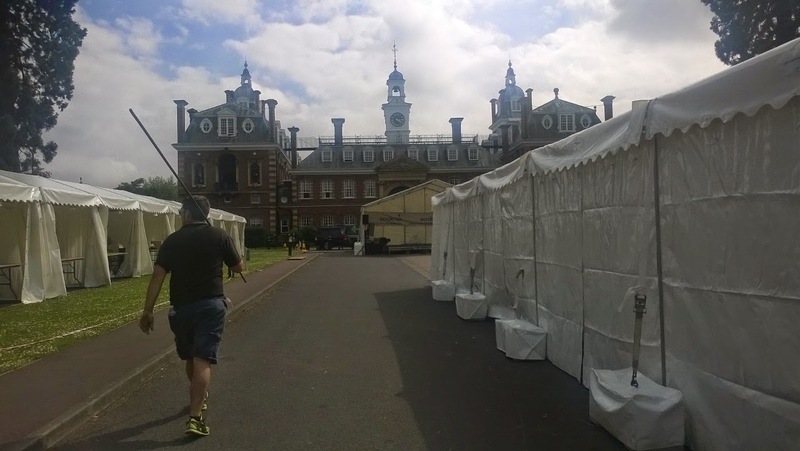 It did start a little late as Michael Gove was still in the big marquee as he'd arrived rather late for his session. How cool is this? Good one TUTE! 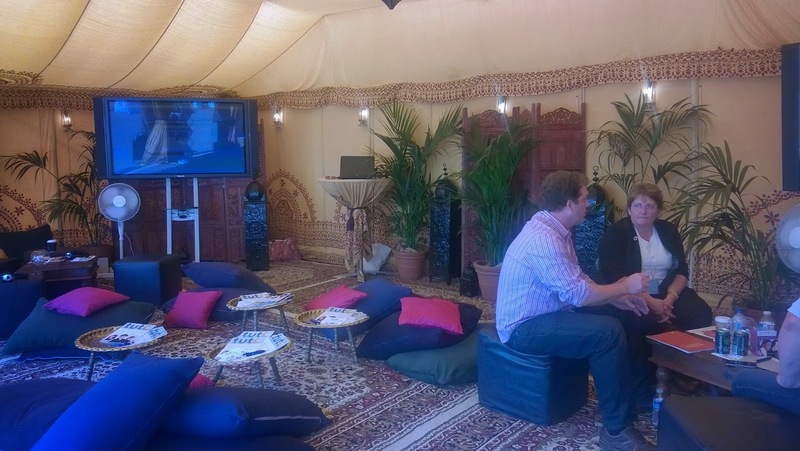 We sat by Tute's absolutely beautiful Moroccan tent - which looked so much classier that any of the other marquees. They had the Costa Rica/Italy match on their big screen too as people lay on cushions in luxury! When we got into the Grand Marquee there was a bar set up and they were getting the food ready. It was actually delicious - a chilli con carne (and veggie version) lemon rice, Mexican salad, nachos, guacamole, sour cream cheese and salsa! The classiest tent in the show! It was so good! 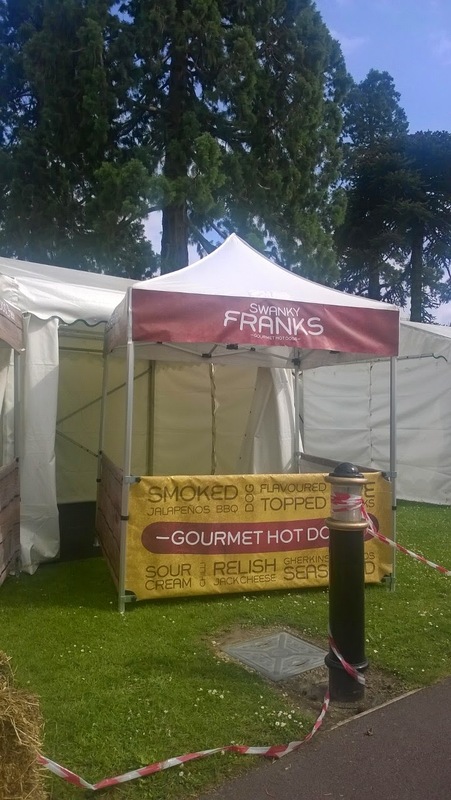 You could even go up for seconds - but we just about resisted! We didn't stay too late listening to the music though as we were pretty tired and hot - and had another day to go! We went right back to the hotel to sleep! 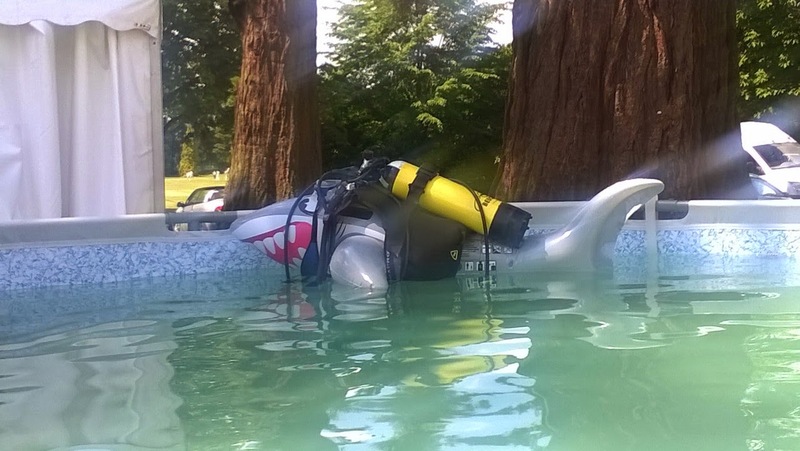 Come snorkelling with the shark! Saturday was hotter than ever and definitely a family day. Although as soon as we got there we were inundated with enquiries! It looked like it was going to be a busier day than Friday. There were lots of attractions for kids - there was a small ski slope and even a pool where you could try out snorkelling. We loved their shark! Darren was lucky enough to meet one of his heroes - Professor Richard Dawkins. He arrived early for his talk and got to have his photo taken with him. He and J enjoyed the session too. By 4pm most stalls had packed up - but we hung on until the end. We got away around 5.45 and Darren got us back home before 9pm. It had been hot and busy - but the beautiful surroundings were a delight! Well, it has been a busy week! 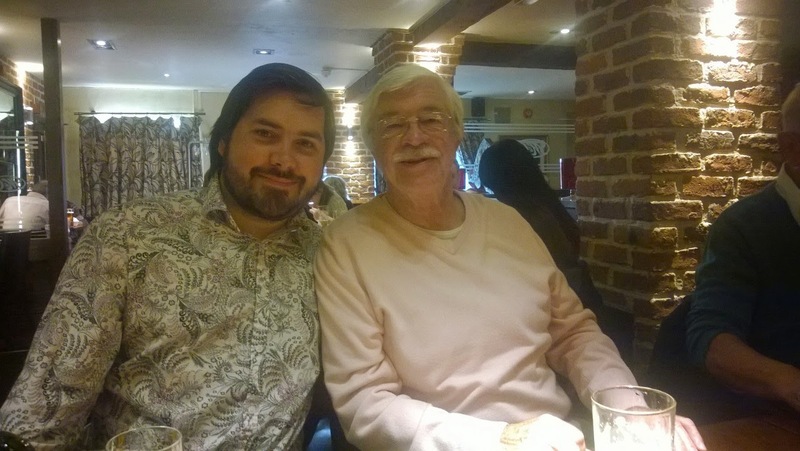 On Tuesday night we took the dads out for a meal - to avoid the Father's Day crowds at weekend. We chose Harecastle Farm as my dad hadn't been there since it became a Miller and Carter steakhouse. It was up to its usual great standard. The food is superb and we love the little extras like their amazing onion loaf and the wedge of iceberg you get with a choice of sauces. I think the dads enjoyed it! They went for the classic steaks and the mums both went for the lamb. I had a little fillet steak - which was cooked just how I like it - still a touch of pink in the middle - but not too much! Of course - with the mums being there too - we had to have desserts! I know I had the banoffee pie and sampled some chocolate brownie and lemon meringue roulade too. I had to be up early next morning to catch a train to Birmingham for a seminar that started at 8.30am! . 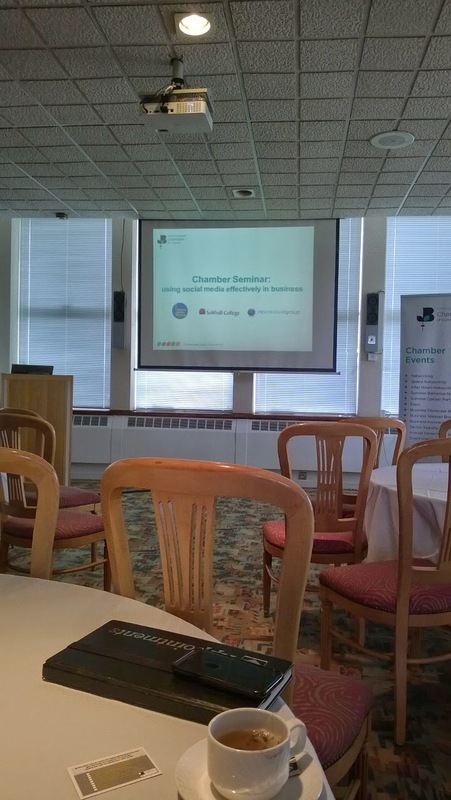 With my Jigsaw School Apps hat on I went to the Birmingham Chambers of Commerce for "Using Social Media Effectively in Business" - a seminar they were running for both members and non-members. It was a chance to learn from the best - they had some award winners to tell us how they do it - and to network with other participants. The first speaker was Dave Cooper, the marketing director from Solihull College. 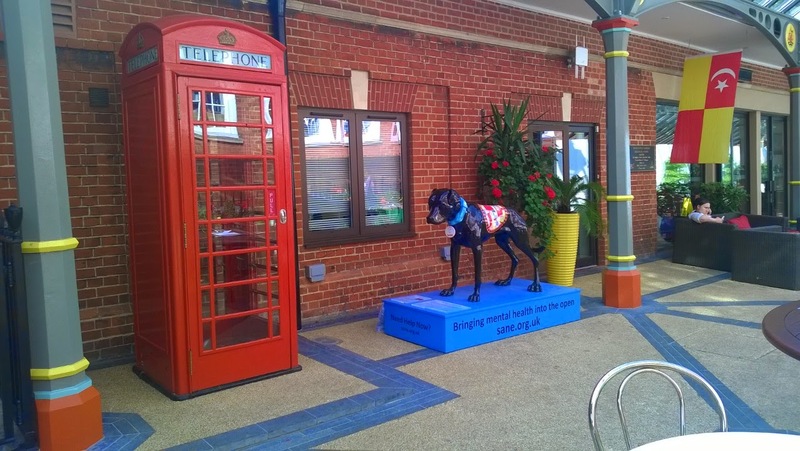 He told us how he moved the college from using predominantly expensive glossy and heavy college prospectuses to more digital and online content. This was after research into how the various age groups that they cater for find their information. Like he said if someone is only interested in doing hairdressing - why would they want to wade through a massive tome full of engineering, child care, sport and other irrelevant subjects? He had fun with a teaser campaign on bus shelters saying "Watch this space!" lots of Facebook - with their Boost facility and an interactive digital prospectus - with smaller ones on Z-Cards - which are cheaper and easier to update. He got their message out there much more effectively - for less money! Then we heard from some professionals - N C Creative Group - also from Solihull - who manage social media accounts for companies big and small. 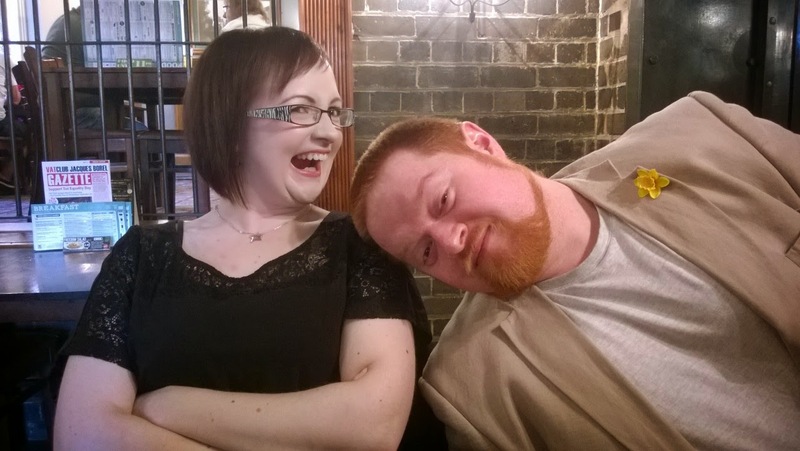 Swedish-born Asa and David explained how, used correctly, social media is a marketers dream! Asa told us that 71% of people online are on Facebook and that Forbes magazine has predicted that 2014 is the year that social media becomes a business necessity - not an optional extra! She gave us some tips such as make sure everything you put on social media is checked carefully - it is a public domain and there are legal implications as with any kind of publishing. You have to spend a lot of time on it too - make sure that you post regularly. Also make sure that you reply to all comments good or bad. Especially the bad - you need to resolve any problems mentioned - quietly and offline if you think it could turn into a dispute. Never have your arguments in public and always remain polite and respectful.! Then David took us through one campaign they had done with one of their customers- Volvo trucks. They made a video - featuring Jean-Claude Van Damme - called The Epic Split - click on the link if you haven't seen it before it is amazing!! They launched it on YouTube and in the first week they sent 470 social media message - through Twitter, Facebook, YouTube, LinkedIn and Pinterest. (Did you know that YouTube is the second most popular search engine after Google? ) So they used all this social media to create an internet "buzz" - so there would be social discussion and press coverage They sent out these messages at weekends and during the night too. They started receiving loads of positive comments - some from Sky news and Paddy Power were taking bets on whether it was a trick or a real stunt (It WAS real!!) Then all the national daily papers featured it on their front pages and it just grew from there. They helped initially by replying to comments and thanking people for viewing. Then people started making parody videos too - which sent even more people to see the video on YouTube. By now it has had 73,338,287 views and they didn't need to pay for a single TV ad. Now I know that not everyone has the budget to pay for JC Van Damme (we don't!) - but it does illustrate the power of social media rather well. The last speakers came from East Staffs CAB, who had been nominated for an award for "Excellence in Social Media" Dawn and Emily told us how they decided to use Twitter to help them. They are no longer government funded so must bid for funds from various agencies. They need to get people involved and to let others know what they are about and what they do as they have to compete with other bigger organisations for funds and resources. Previous to using Twitter they used to send out a press release to the local press once a month. They set themselves a target of getting 50 followers in the first week and 20 by the end of a month. They also started by following local journalists, MPs, decision makers. They send out 2/3 tweets per day and talk about what's happening with the staff, any events they might be having and most importantly they tell stories! That is what really works. They talk about the things they have done to help their customers week by week. Maybe they've saved someone's house, helped find someone a job or dealt with someone's dept. Of course they change names and other details which could compromise the privacy of the actual client. They also said that photos work really well too. They also set up the hashtag #CABlive - and event that happens once a year where they invite other Citizen Advice Bureau to join them to tell their stories too. So for very little money they have got almost 1000 followers and anyone can see what they do. Emily did warn us that you need to make sure that there is someone to take over the tweeting if the main person goes on holiday or has a weekend off. You need to be able to reply and tweet regularly to make a difference. New and old combined - love it! 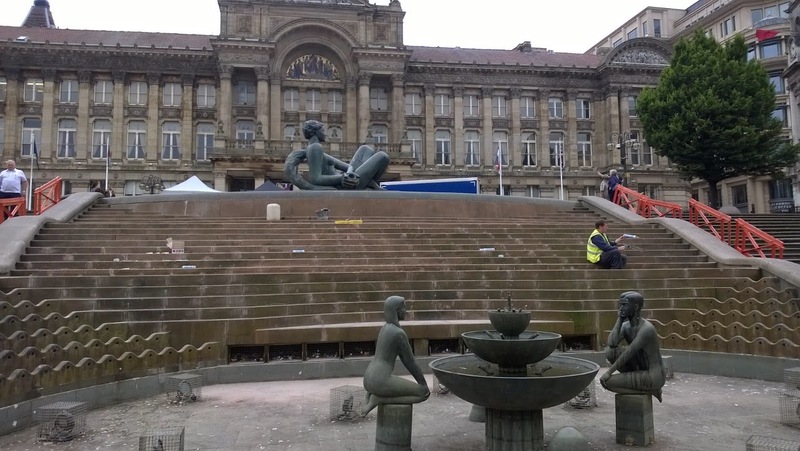 Floozy's Jacuzzi not working today! At the end of the presentations we were able to put questions to any of the speakers. I asked if they could see a future for using apps in marketing. I told them of the success we were having with schools having their own apps and did they think they would work for businesses too. David said that when apps came out initially lots of customers asked them for one - but when asked what they wanted it to do they didn't know! However, he could see a value for them the way we were using them in schools. 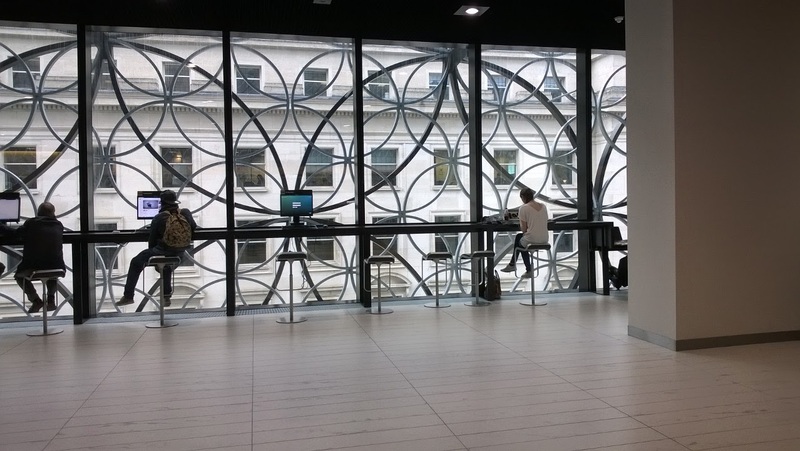 I took the chance to visit Birmingham Library - as it is the first time I've seen it. 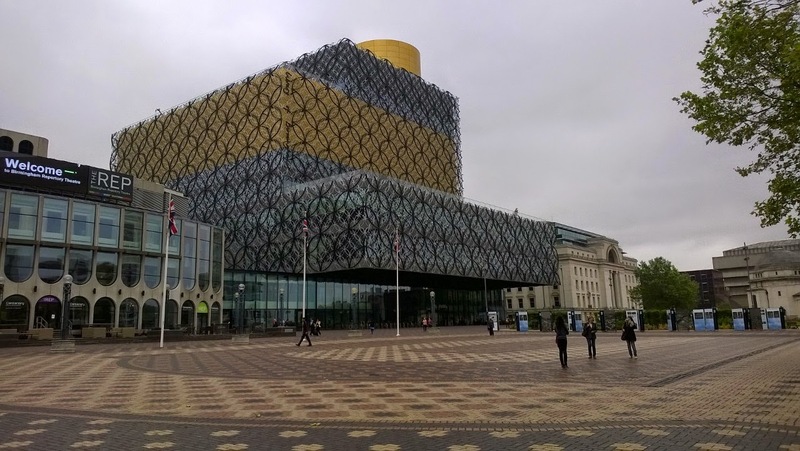 It is a stunning building and a surprising mixture of old and new inside. I loved it - shame I couldn't spend all day in there! Well, it has been quite a roller-coaster week. I will try and concentrate on the positive here! First of all I want to say "Get well soon" to my sister-in-law, Jan, up in York. She's had a major op today - we are wishing her a speedy recovery! The BOOK GROUP team comprised Janet, Tracy and myself - with the addition of my sis-in-law Sharon. I have to say that newbie Sharon turned out to be the fittest of us all! As we were complaining towards the end that our feet, ankles, calves hurt - Sharon was raring to go round the lake again! She had done more training than us though - she walks two miles a day - to and from work. It was great to have her on the team and we all enjoyed catching up on each others news (otherwise known as gossip) and the way round. So, it looks like we might exceed our target once all the money is in. Don't forget - there's still time to donate to Cancer Research for a few more weeks. 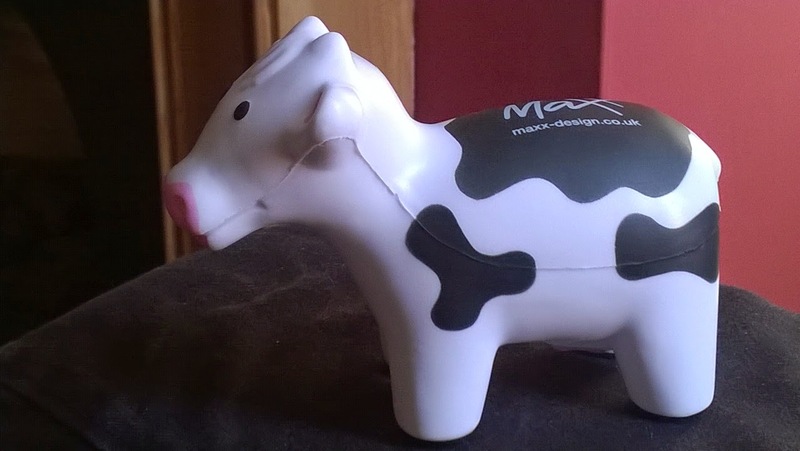 Check out our Just Giving page if you can spare a pound or two. 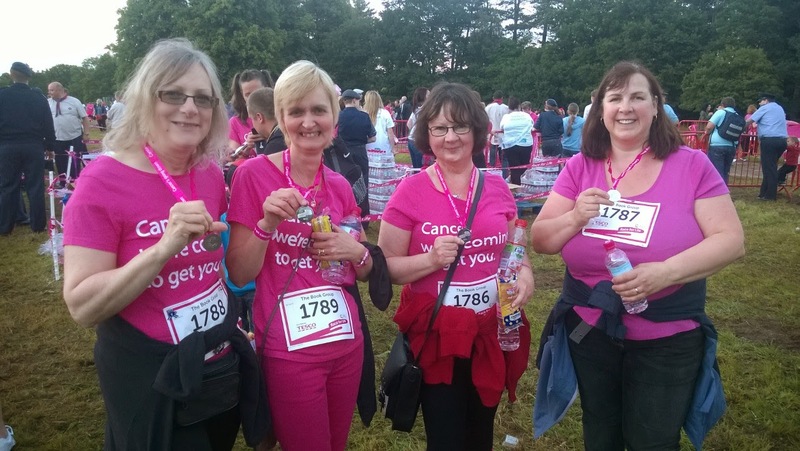 We saw some very poignant messages on other participants backs - one just in front of us all the way said "Running for my mum, my daughter and me" - three generations in the same family with cancer. This disease has no mercy - research is vital!! Thanks to Nathan and Laura and my brother Dom for being there to support us and cheer us on - and take photos! Also to Al, who only made it at the end due to work - but wished us luck via Radio Stoke. Also thanks to everyone who has sponsored us. We'll be back next year! Today we cashed in Laura's Christmas present! 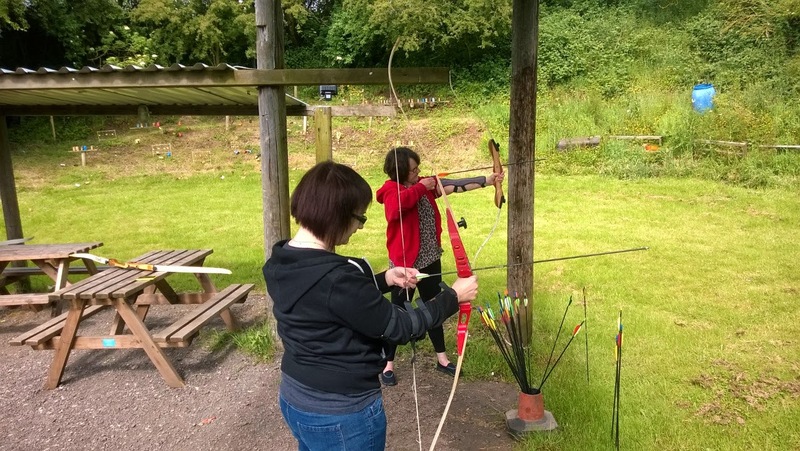 N had bought her an "Archery Experience" and we've been waiting for some nice weather and a free day to go and have a try at it. We booked with Ashcroft Park near Uttoxeter - so turned up there just before 10am this morning. We parked in the middle of a field and looked around for signs of life. We saw a grouse walking down a path - so we followed it and a few seconds later we heard a 4x4 approaching. It was John - our instructor for the morning - who told us to hop in and he would take us to the Archery area. The place is huge and they have so many activities there including paintball, quad biking, go-carts, laser shooting and much more! ﻿﻿ We bounced over the fields in his muddy vehicle - which was kind of fun to start with. 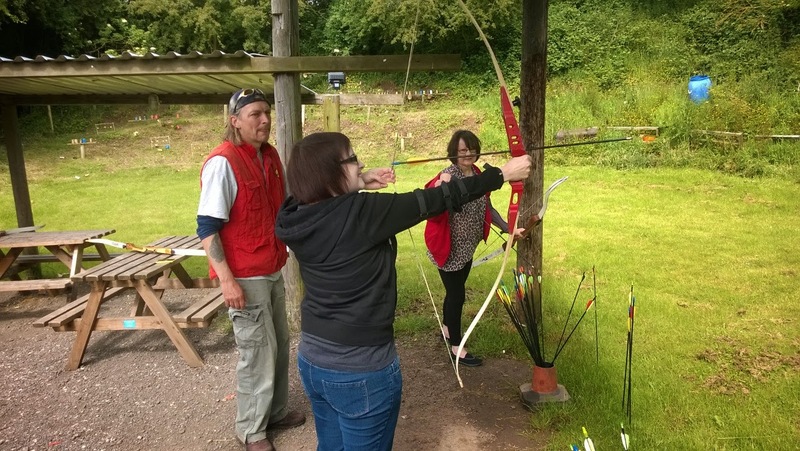 Then we got to the archery range. 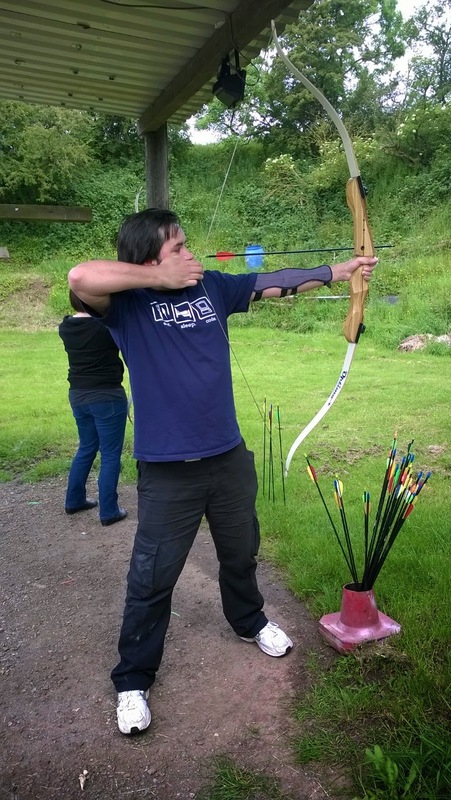 John got out a range of bows - as L wanted to try it left-handed. 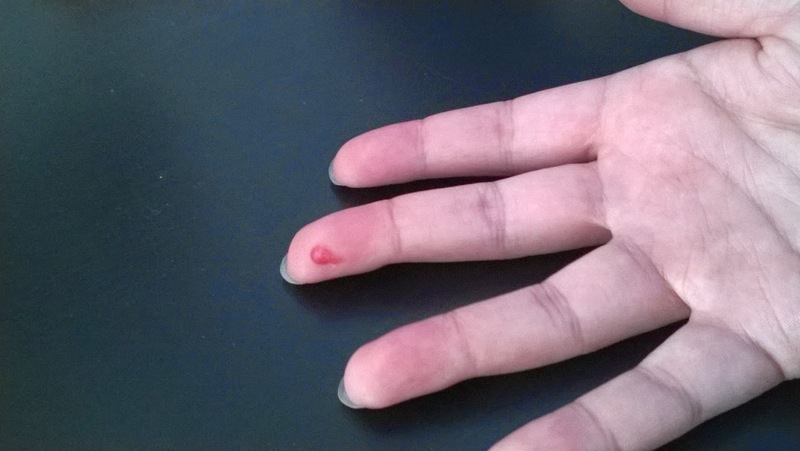 We are all left-handed - but I thought I'd try it with my right hand first. He got a bigger one for N, some wooden ones and a metal one. He showed us the best way to hold a bow, how to load it up with an arrow and how to stand with relation to the target. ﻿﻿﻿﻿N had done it before - once, but l and I had never tried it! We all had a first shot - L was really good - and got near the bullseye on her first go! I took a little longer to get the hang of it - but N was really good right from the start. I was delighted to get a bullseye eventually though! At one point John put a balloon for each of us on the targets and told us to see who could pop theirs first. N did it first arrow - followed closely by L. I took a while - but it felt really good when I aimed and burst it right on the centre! Then I got a few more bullseyes. ﻿﻿I think we all might have sore muscles tomorrow - but we'd love to do it again. Or maybe some shotgun shooting - they had a lot of tin cans set up nearby - I'm sure that would be good fun too. John said we should try the Blindfold Driving - but that might be taking things a little TOO far!! 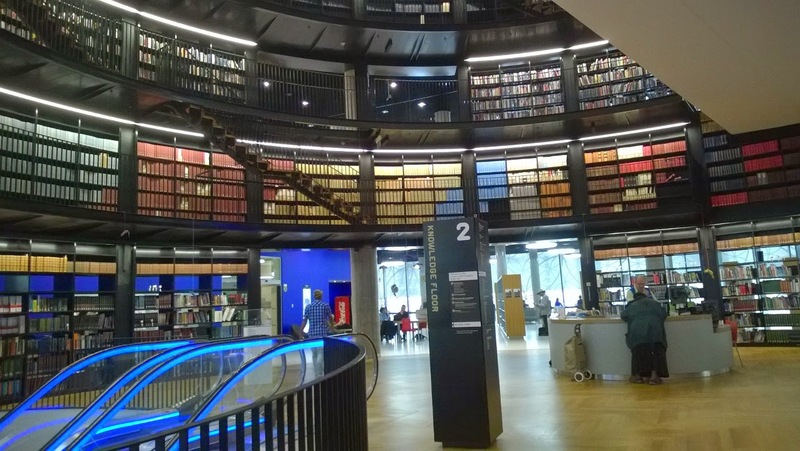 24 locations where we’ll explore a range of options including opportunities for community organisations to lead, manage and deliver the library offer, giving them the opportunity to maintain or introduce services to meet local need. SCC will support communities to take on this role but won’t be directly involved in the management or staffing. It will be highly focused on the community. So, it looks like my days at Silverdale are numbered. I have put my heart into the library and know all my customers by name. I just hope that we get some good volunteers to keep it open for the community. I'd hate to think that Mr C would have nowhere to go to pick out his horses and have a chat each day, or the Poets of Keele have nowhere to hold their classes and display their work, or Silverdale no longer has cool events like the time Simon Armitage came (Click to read the blog post about that) or when 60 excited kids saw Julia Donaldson and performed Room on the Broom for her. Or wonderful performances like the recent TOWN by Joy Winkler. I am heartbroken that I'll not be there to hear the news from the village everyday or the laughter and music of the French class on Tuesdays or the birdsong coming out from the meeting room when the Bird Watchers of the WEA are there on Thursdays or the knit and nattering that goes on during Friday afternoons. I have no idea what will happen to me - I've just realised I'm going to have to change the tagline of this blog - and probably even my name. Will I still even be a Poker Librarian? 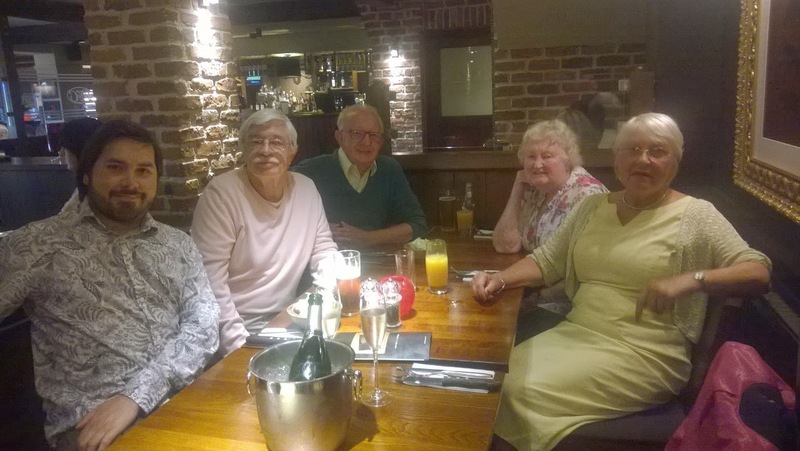 Last night we decided to celebrate Nathan's company - Jigsaw School Apps - getting its first ever independent review - http://www.teachprimary.com/tried_and_tested/view/jigsaw-school-apps and go out for dinner! 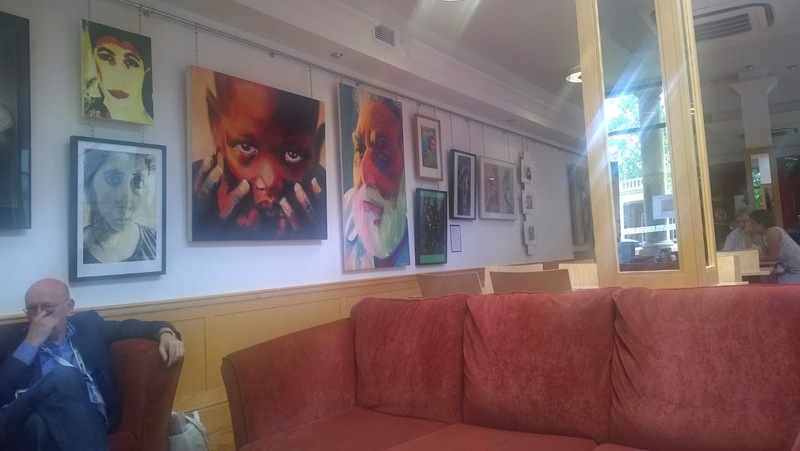 We had popped into Café Michelangelo a few weeks ago to see Mike Muir, the proprietor, who told us that he was changing Michelangelo's from a café to Bistro Michelangelo. 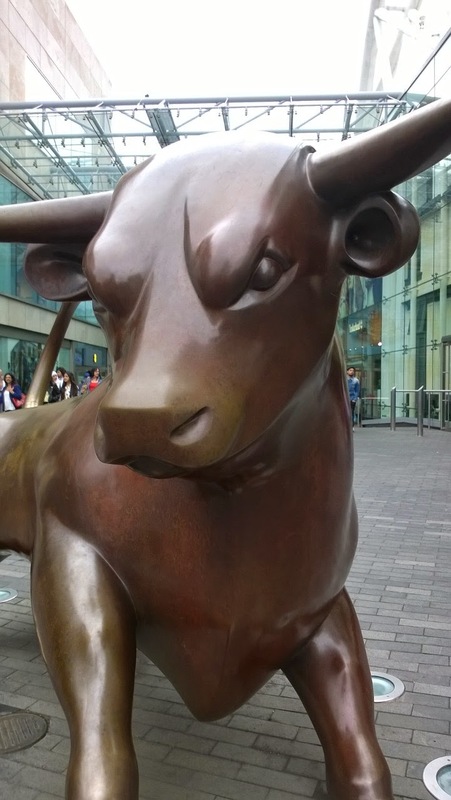 It is situated in The Ironmarket - with tables and chair outside for anyone who wants to sit and watch the world go by. 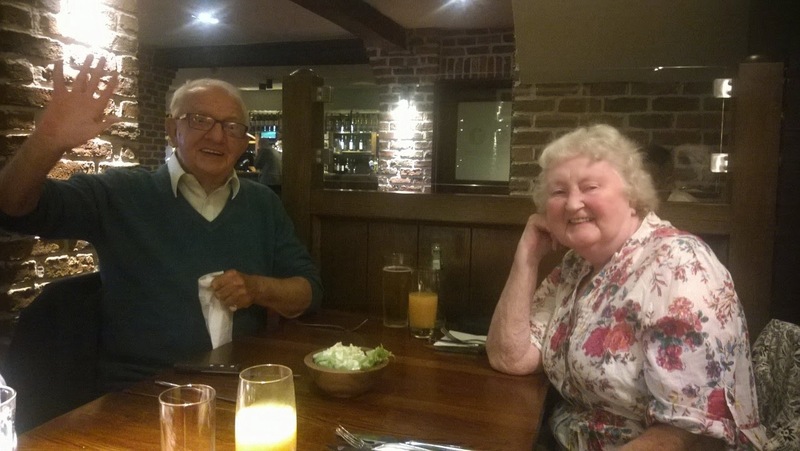 Nathan had known Mike and his wife Gaynor, since he lived in Leek and used to go to Café David frequently - which Mike used to own and run back then. 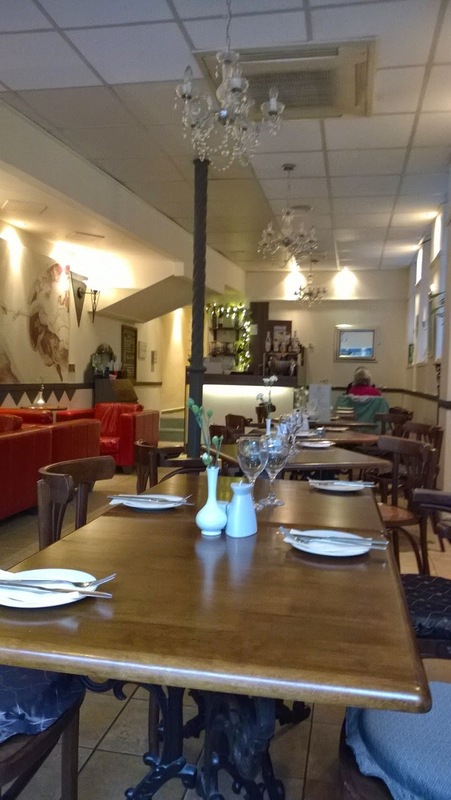 Then Mike moved onto Café David and Trentham - which he sold and moved into Newcastle to Café Michelangelo. It has been open during the day serving sandwiches, cakes and drinks - we have been in for one of his legendary hot chocolates before! He told us that he's been persuaded by a business partner to re-open as a restaurant. I had been once to Café David in Leek and the food had been gorgeous so we resolved to go back once he was up and running with his new chef, Colin, making evening meals. We took a chance on Tuesday night and not only was he open but he found us a table right away. 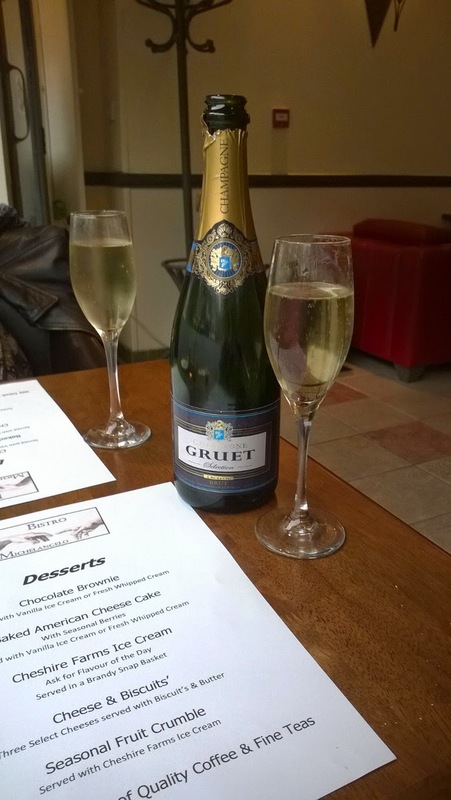 Having ordered a bottle of Prosecco, he returned from the bar to say that it wasn't quite chilled enough yet so would we mind if he upgraded us to Champagne. Needless to say - we didn't mind at all! We sipped it while we chose from the comprehensive menu. Nathan decided on a goat's cheese and caramelised red onion filo tart while I was feeling a bit chilly so opted for the hearty pea and ham soup. They were both beautifully presented, my soup was smooth, hot and very tasty and came with some toasted baguette. Just what I needed. Nathan was making very appreciative noises over his tart, which was sweet and tangy and light. We were very impressed so far! For a main N went for the cod loin with chorizo and tomato sauce. I decided to go for the roast chicken fillet with stilton sauce, twice-cooked chips tomato and mushroom. Again they were both presently really well on wide long plates. The chicken was really nicely cooked, piping hot and moist and tasted wonderful with stilton sauce. The crispy chips were so soft and fluffy inside. You didn't need many as they were just a perfect complement to the rest of the dish. Mike was attentive throughout, topping up our glasses when they threatened to get empty. To get the full experience we thought we'd better try a dessert too. 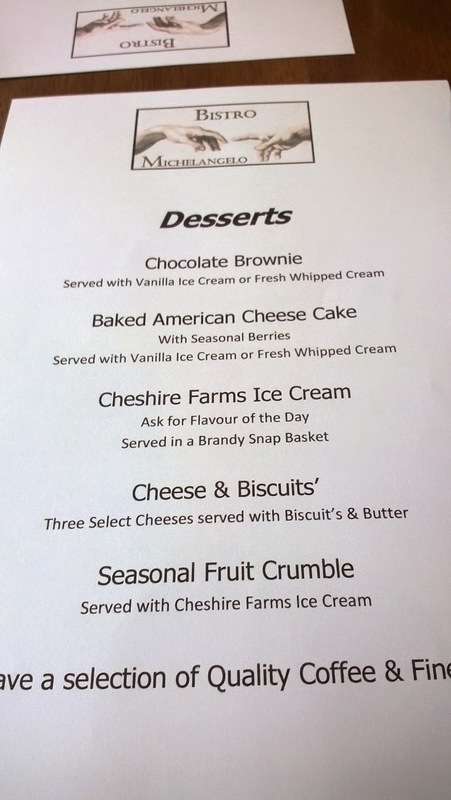 I had an inkling that Nathan might go for the chocolate brownie - which came square and flat, studded with walnuts and topped with Cheshire ice cream. I didn't try any - but N said it was really good. I tied the fruit crumble of the day - which was strawberry and apple. There was an abundance of fruit, warm and sweet and not too much crumble - just a sprinkling on top. I also got some Cheshire ice cream too! We had a chat with Mike before we left and asked after Gaynor, his wife. I've seen her a few times at the hospital - as she runs Fresh Hair - the wig and treatment salon in the Cancer Centre. He told us that the fundraising for a brand new premises in the hospital grounds had been so successful that they are beginning the new building very soon. At the moment they are still in a corner of the chemo ward. They provide a great service - I can't tell you how much better I felt when I had my wigs. Bistro Michelangelo is still open all day too and provide the daytime menu as normal. They've had quite a lot of interest so far from their daytime customers - who try the evening one and then are returning and bringing friends with them! We are thinking of taking friends with us next time. 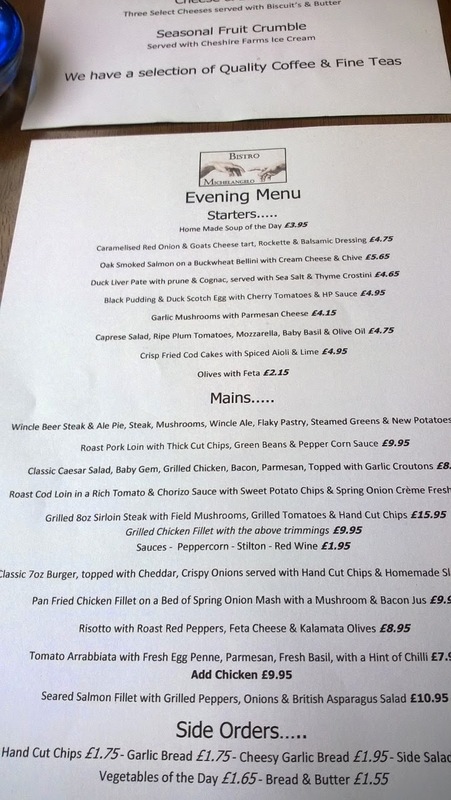 We can't wait to try other things on the menu! 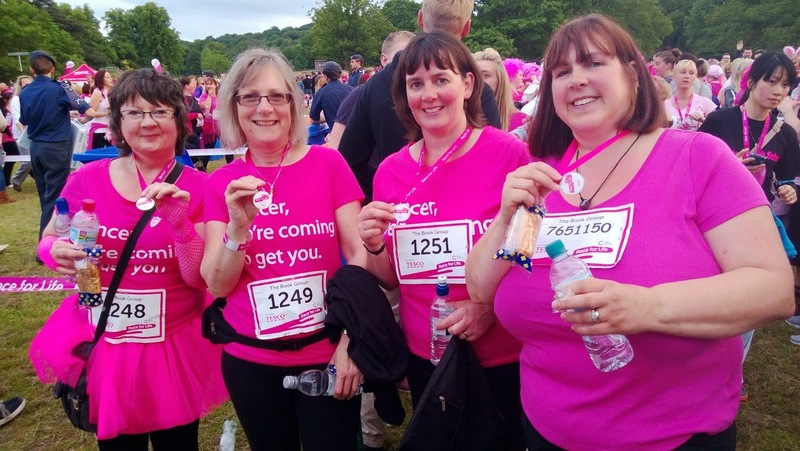 It's June - that means Race for Life again! 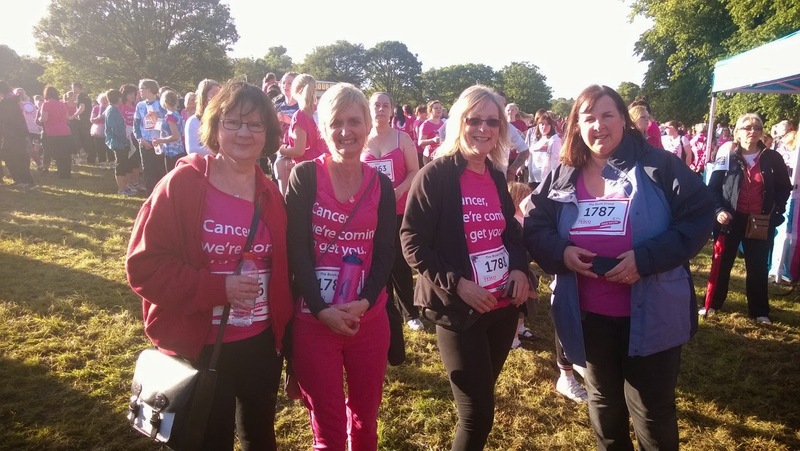 Race for Life - last year. Can you believe it's June already? 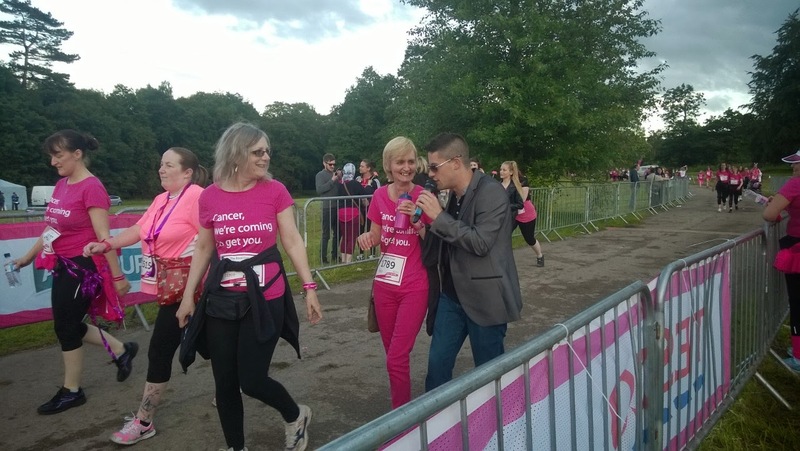 That means less than two weeks to go to the RACE FOR LIFE at Trentham. It will once again be a sea of pink with tutus and rabbit ears galore as hundreds of women are cheered on by their supporters to walk/jog/run 5k in return for donations to Cancer Research. Everyone of them will have a different story of how cancer has touch their lives and the lives of their loved ones. It's a very worthwhile cause - to get more research funded so that we can get rid of this terrible disease in all its forms. This time it will be Tracy, Janet and myself - joined by my lovely sister-in-law, Sharon. 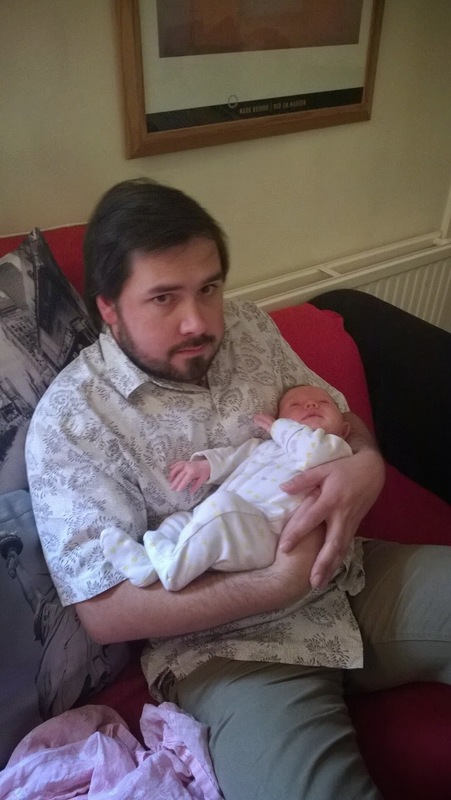 Welcome to the world Ellie-Rose! 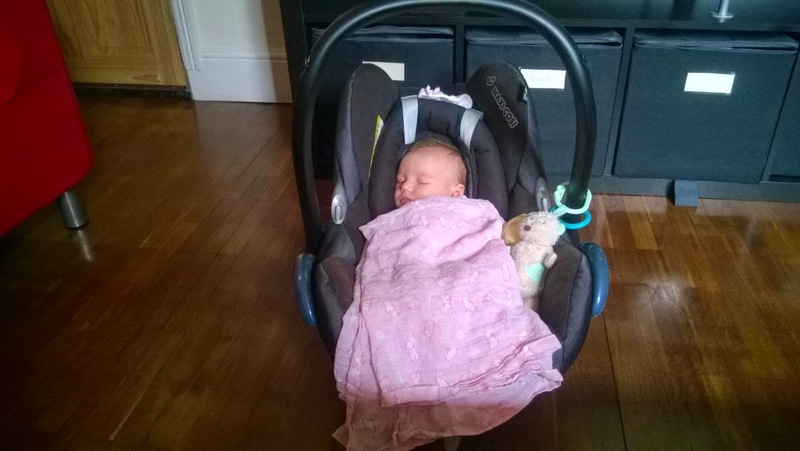 The highlight of the last week was meeting Ellie-Rose - the new daughter of our friends Heidi and Si. We'd seen her on Skype - but it was so lovely to see her in real life last week. She is gorgeous! Very well-behaved too. She slept quite happily in Nathan's arms for a while, hardly cried at all! I am very happy to see that she is already reading the classics of children's literature - her proud parents posted a photo of her reading "Each Peach, Pear, Plum" already. Good work Si and Hide!! We look forward to seeing more of you all very soon! Had a nice Saturday afternoon/evening in Congleton - also known as Beartown. I think this stems from a story about the town losing its resident dancing bear - just before the town's carnival festivities, so they used the money that had been put aside for a bible to buy a new one! We went over there to visit our friend Pete, along with a couple of others (Hi, Jo and Mawb!) and Laura too we had a walk around town and sampled a few of the hostelries and their ales. 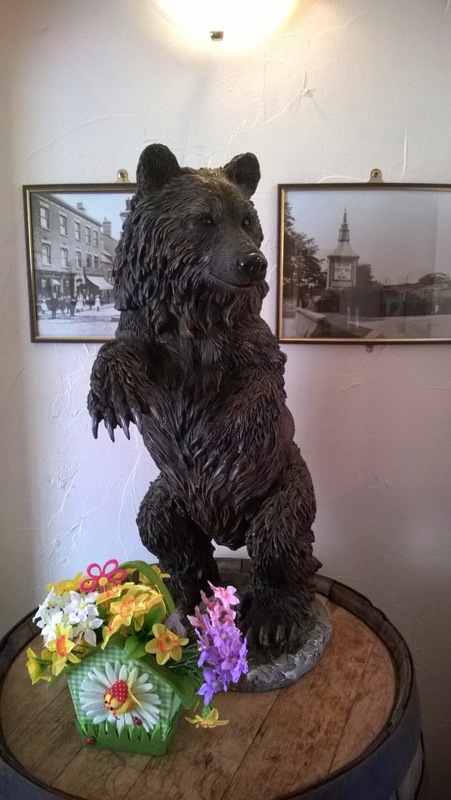 This example of the famous bear was in the Beartown Tap. It was really nice in there with a bookcase full of books to peruse and a stack of board games. How about some Handel's Water Music? 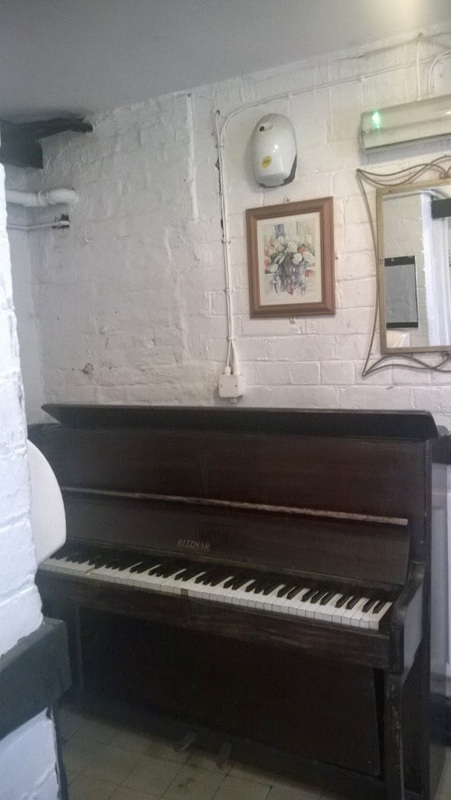 Also another pub we visited, Ye Olde White Lion, which had a piano in the Ladies toilets. Not sure why - but you can tickle the ivories if there's a queue! It also has a huge beer garden and as it was such a gorgeous day we decided to sit outside. 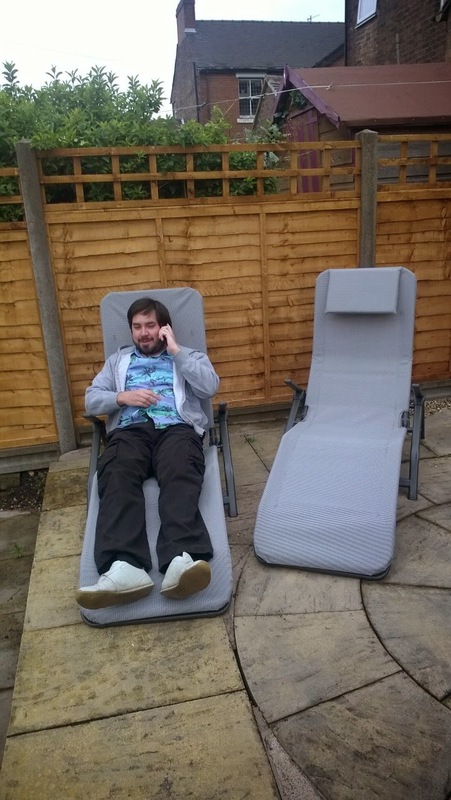 Sunday has been another hot day, so at last we got some use out of the sun loungers that Nathan's parents got for us last week. I can confirm that they are pretty comfy and quite conducive to an afternoon nap! Laura and Pete in a bank vault!